"An admirable ruse, indeed! To inspire in me the horror of females, only to throw it in my face and say: but this is what you are." The handsome, heroic heir to a vast estate, raised as a man to follow a man's pursuits and to despise women, is devastated to learn at the age of seventeen that he is in fact a she. 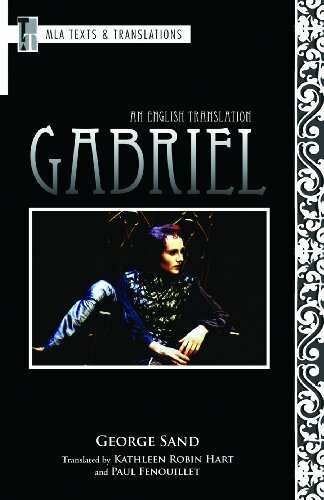 Gabriel courageously refuses to give up her male privileges, and her tragic struggle to work and fight and love in all the ways she knows how offers a window into the obstacles faced by George Sand, the prolific intellectual woman whom the popular press portrayed as a promiscuous, cigar-smoking oddity in trousers. "Strange that the most virile talent of our time should be a woman's!" exclaimed a reviewer in 1838. Kathleen Robin Hart's introduction contextualizes the drama, discussing its relation to the theater of Sand's day, the sentimental tradition, the subversive workings of carnival and masquerade, and the vein of literary androgyny in Romantic works. If you have any questions about this product by Brand: The Modern Language Association of America, contact us by completing and submitting the form below. If you are looking for a specif part number, please include it with your message.